Sithembele Mgadi attended an art class in 2000 where he learned how to mix colors and draw. 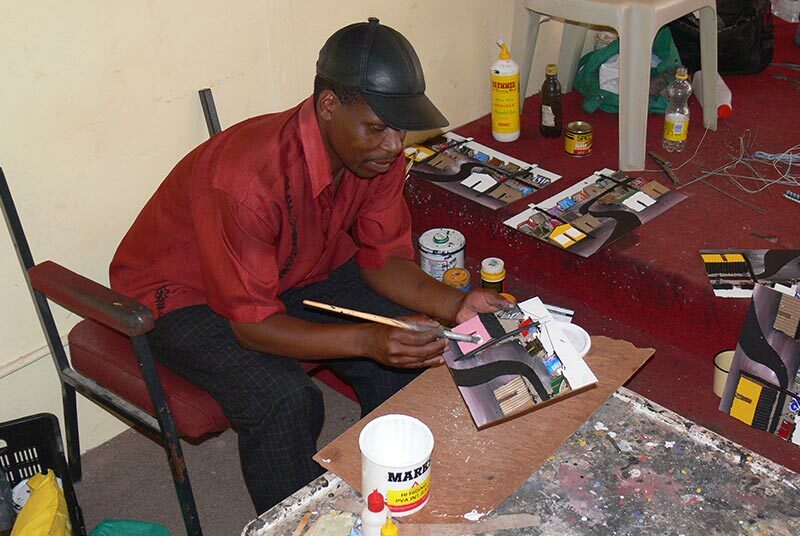 After training he didn’t have enough funds to buy all the materials he needed for drawing, so Mgadi had an idea to work with used material which he recycles. After trying several methods he started creating 3D pictures of the townships. His work quickly became popular which led to other artists trying to copy his work. His 3D artwork is made out of cardboard, wood, paper, tins and other materials. Besides his workshop in Khayelitsha, you will also find his artwork being displayed in a few art galleries around Cape Town. Mgadi also does individual work according to your ideas and specifications.